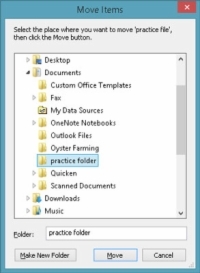 You can move files around File Explorer in Windows 8.1 to organize them for efficiency, by frequency of use, or any other way you like. 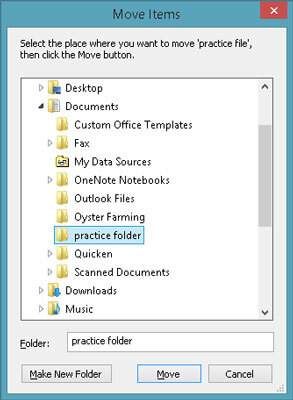 1For this exercise, select the Documents folder in File Explorer. Select one of your documents. 2On the Home tab, select the Move To button. If you see the location you want in the drop-down list, you could select that location. A window opens, showing every possible location. 4Select Documents, and then the destination folder for the file. Or select the Make New Folder button and name that folder. 5Finally, select the Move button. Unless you move many files or large files, you may not see any indication that the move was completed. 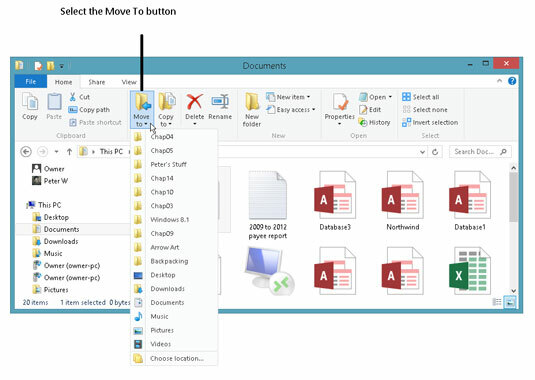 6In Explorer, select the folder to which you moved your file. There it is! Note that the Copy To button works similarly, except the original file stays where it is and a copy is created in the new location. Use these same steps to move a subfolder from one folder to another. However, don’t move folders that Windows 8.1 creates. 7You can move a file in a single step. Click and drag or tap and drag the file to the desired folder. When the file is over the folder, release the mouse button or lift your finger. Although this method can make moving easier, it can also make it easier to move a file to the wrong destination. Double-check that the file ends up where you want it before going on to other things.